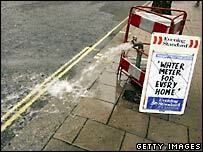 Thames Water has unveiled plans to spend about £1bn in the next year as it tackles leaky pipes in London. About 540km of the Victorian-era pipelines will be dug up and replaced as part of its continuing efforts to improve performance. Thames said the cost of its investment programme in the year to the end of March meant profits fell 22% to £270m. But the programme helped it to reach leakage targets set by regulator Ofwat of 810 million litres a day (mld). It was the first time since 2000 that the firm had hit its targets. Thames added that in April to June this year, leakages had fallen to around 702 mld. A year ago the firm was heavily criticised by Ofwat and consumer groups for losing 894 mld, at the same time as it was imposing a hosepipe ban and seeing its profits rise 31%. Thames was bought by Australian investment firm Macquarie last year for £8bn. "The battle to restore the company's standing has only just begun, but Thames today is a stronger, more efficient and more reliable company than the one the new management team inherited," said chief executive David Owens. "There is still much to be done... but there are signs of real progress." As well as spending on capital investment being up 40%, the firm's bottom line was also hit by rising power bills, Thames said. Mr Owens said that replacing the pipes was a huge task. "These cast-iron pipes have been in the ground for 100 to 150 years, being corroded by the acidic clay," he said. "The pipe is like a colander when it comes out of the ground - not just one crack or one hole." Despite missing its leakage targets every year since 2000, Thames Water incurred no sanction until 2005/06. Even then, Ofwat did not use the new powers it was granted in 2005 to impose financial penalties, accepting instead a legally binding undertaking to carry out the £150m replacement of 230 miles of water mains. Ofwat said that Thames' latest results was good news for water consumers and showed that its "consumer-focused approach" was working.